Two talented Nature Artists’ Guild’s members who also happen to be popular instructors at The Morton Arboretum will be teaching a three-evening class titled Amphibian Art: Frogs Across Forms beginning on Tuesday, July 26, 2016 from 6:30 until 9:30 pm and continuing on the following two Tuesdays. 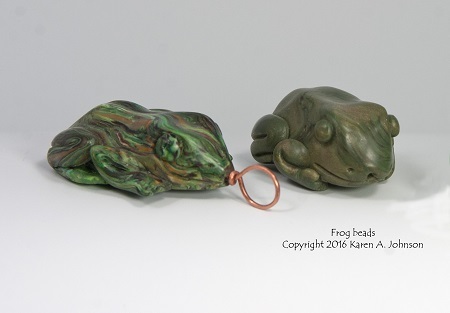 Participants in this class, taught by Suzanne Wegener and Karen Johnson, will be looking at artsy amphibians from different points of view and interpreting fabulous frogs in various media. Students will complete some drawings and even a croaker creation from polymer clay bead. For more details (minus the poor puns and awful alliteration), please click on this link to The Morton Arboretum’s class listing. It is sure to be a “ribbiting” experience! I thought the puns were great! Happy 4th!